Today, I thought I’d introduce to you to a cool group of animals that is ubiquitous in the oceans (including the Norwegian seas), but unfamiliar to most people. Siphonophores (“kolonimaneter” in Norwegian) belong to cnidarians, a group that includes corals, anemones, hydroids and jellyfish, and is characterized by the presence of stinging cells used in prey capture. All siphonophores are predatory, and use their stinging tentacles to catch small crustaceans or, in the case of some species, even small fish. The most (or only) familiar siphonophore for the majority of people is probably the highly venomous Portuguese Man O’War (Physalia physalis), which can be spotted floating on the surface of the ocean or stranded on beaches. However, it is not really representative of the group as a whole, as most siphonophores live in the water column of the open ocean rather than its surface. There are around 200 described species of siphonophores. The most fascinating feature of siphonophores is their peculiar body plan. While siphonophores may appear to be a single animal, they are in fact a colony of physiologically connected and genetically identical but morphologically diverse individuals called zooids that have specialized to carry out different tasks for the colony. Siphonophores belong to the class Hydrozoa (“polyppdyr” in Norwegian), which covers two basic body plans: the polyp/hydroid and the medusa. The various zooids comprising a siphonophore colony can also be divided into these main groups. For example, the zooids used for swimming, called nectophores, are medusoid, while the feeding zooids, or gastrozooids, are polyp-like. The siphonophore colony can also include specialized defensive, protective and reproductive zooids. All the zooids forming a colony arise by budding from a single fertilized egg. The different zooids are specialized to the degree that they cannot function as individual animals any more, and are only able to perform their specific tasks as parts of the siphonophore colony. The zooids, for example the swimming nectophores, vary in appearance between species, and can be used for species identification. In addition, the various types of zooids in the colony are arranged in a strict species specific pattern, providing the intact colonies of each species with their particular appearance. 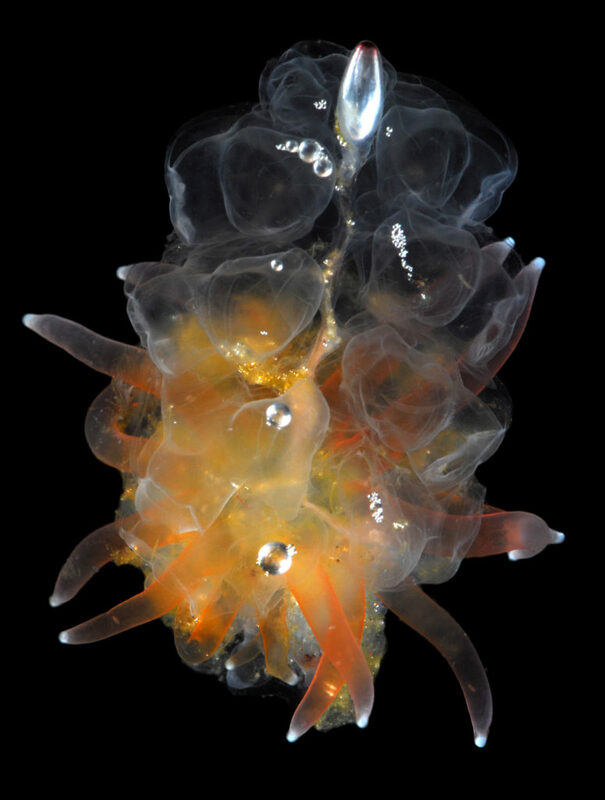 While the individual zooids are generally small, millimeters to centimeters in size, some siphonophore species, like Praya dubia, may have colonies that reach 40 m in length! Siphonophore colonies generally have a zone of one or more (up to several dozen) swimming nectophores at the front, used to pull the colony through water. 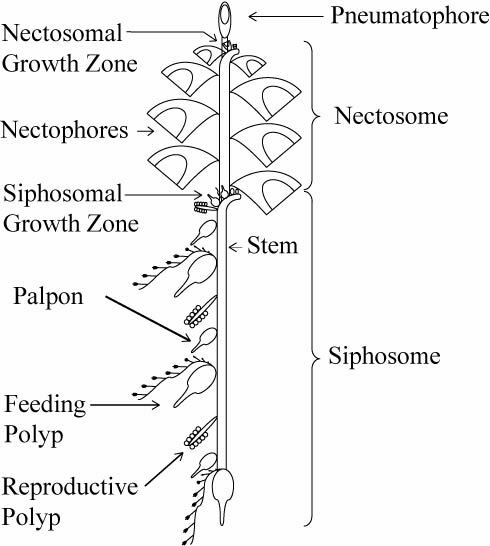 Behind this nectosome is the siphosome, which contains the feeding, reproductive and other zooids in a repeating pattern, each iteration of which is called a cormidium. In some species (suborder Calycophorae), these cormidia are released as small free-living reproductive colonies called eudoxids. Unfortunately, siphonophore colonies are extremely fragile and tend to fall apart during standard plankton sampling with nets, leaving behind a bewildering array of small bits and pieces – part of the reason they are relatively poorly known to most people. Intact siphonophore colonies are beautiful, but often utterly alien in appearance. It is interesting to consider where to draw the line between an individual and a colony. While we as individuals have specialized organs to carry out our various bodily functions, siphonophore colonies are made up of specialized interdependent individuals or zooids similarly carrying out their specific tasks. As part of project HYPNO we are charting the diversity of pelagic hydrozoans, including siphonophores, in Norway. 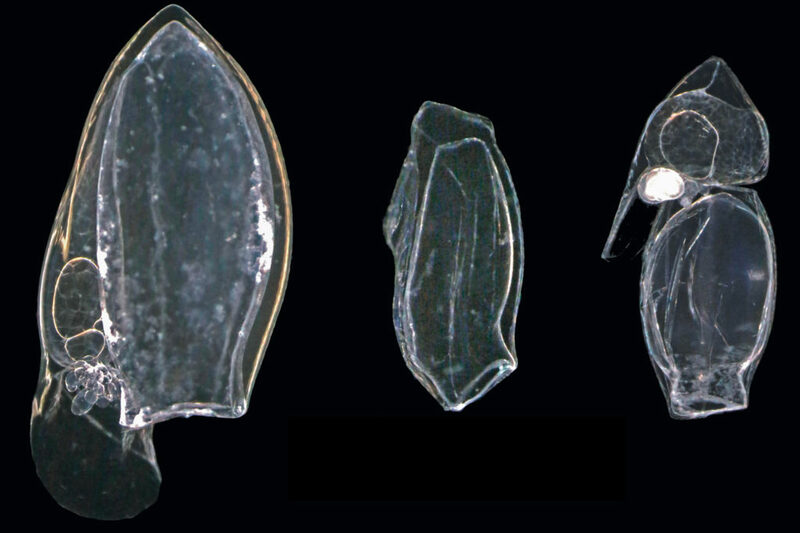 There are ~15 species observed in Norwegian waters, and some, particularly Dimophyes arctica, Lensia conoidea and Nanomia sp. are extremely common components of marine plankton. However, siphonophores are primarily noticed when they become a nuisance: For example, mass occurrences of Muggiaea atlantica and Apolemia uvaria have in the past killed large numbers of farmed fish in Norway, with resulting losses to aquaculture companies. Intrigued by siphonophores? For more information, visit e.g. http://www.siphonophores.org/ by Casey Dunn. This entry was posted in 2016 december calendar, Current projects, Field work, HYPNO, NorBOL, Photography on December 10, 2016 by katrine.